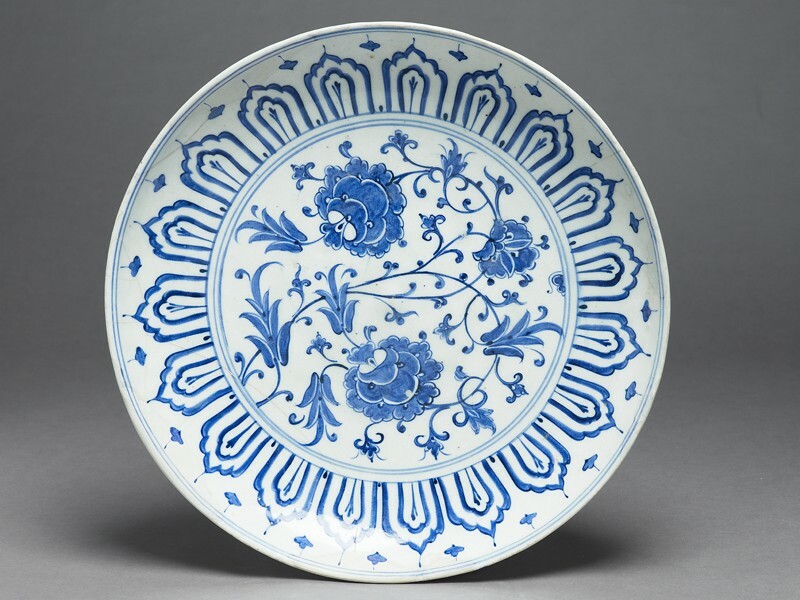 The naturalistic painting of tulips, carnations and other flowers never completely ousted the earlier designs and colour schemes of Iznik ceramics, as this delightful dish shows. The combination of blue and white, the large peony blooms, and the lotus-panel arcading all derive from Chinese art, which had so influenced designs in the second quarter of the century. To this rich artistic source the potters periodically returned for their inspiration. The overall impression is of a fluid and free movement of stems and ears of wheat. In truth, however the design has been very carefully planned. At its heart is a pointed oval shape formed by the two main stems of the plant. The two large peony blooms balance one another on either side of this oval, and the smaller peony above is balanced by the ear of wheat next to it. The fluidity of the design is in fact due largely to the curving entry of the main stem and the positioning and sizes of the four ears of wheat in front of, and either side of it: a very subtle and very charming piece if design. Historically, this dish and others like it are of considerable interest. For in the 1570’s Francesco de’ Medici, Duke of Tuscany, was experimenting with making imitation porcelain. 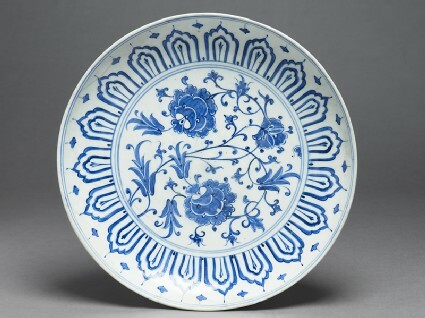 In 1575 the Venetian Ambassador to Florence wrote that the Duke ‘has equalled its quality – its transparency, hardness, lightness and delicacy; it has taken him ten years to discover the secret, but a Levantine showed him the way to success.’ The fact that several pieces of Medici porcelain have stylistic affinities to the wheatsheaf style, and that technically both Medici porcelain and Iznik use a quartz or sand body with a small portion of clay, suggests that the Levantine might well have come from Iznik itself, bringing with him the secrets of the Iznik potteries. N. Atasoy and J. Raby, Iznik. 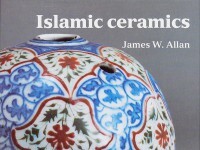 The Pottery of Ottoman Turkey (London 1989) p.268.